More than 35 years later, and this contains what is still among the best exploding-head scenes of all time. No doubt about that. Unfortunately, the rest of the film struggles to come anywhere close to matching it, and since the skull-popping happens barely ten minutes in, there’s a significant sense of letdown thereafter. Many of the themes here are common to Videodrome, such as the illicit corporate exploitation of “black technology”. It’s almost as if Cronenberg realized he didn’t do them justice, so went back for a do-ever, and got it right next time. The main issue here is probably Lack – about whom Chris derisively snorted “Lack of talent, more like,” with justification. For he went on to have a long, successful career… as a painter. It’s likely where the gulf between this and Videodrome is most obvious, with James Woods in an entirely different league as far as acting ability goes. Even past Lack, the rest of the cast are generally better than the lead, in particular Ironside, who reminded me of a young Jack Nicholson, bringing a similar sense of “loose cannon” to Revok. McGoohan is also solid, as the supposedly altruistic scientist, who knows rather more than he’s letting on. O’Neill, playing a kinder, gentler scanner, is entirely wasted – the female lead is another area where Videodrome kicks the arse of Scanners, even though Debbie Harry had less acting experience than Lack. In comparison to Cronenberg’s other works from this part of his career, this is almost mainstream, disappointingly free of the lurid sexual and body horror subtexts which are a significant part of their appeal. And the scanner battles basically consist of the combatants pulling faces which make them look constipated, more than anything. Add an approach to technology which is amusingly primitive at best (this was an era where it seems as if everything was primed to explode – cars, computers, phone booths), and you get something that has not dated nearly as well as most of his movies. There are some interesting ideas at its core, but the problems with the production are obvious. The movie was rushed into shooting without a finished script, Cronenberg rising early and dashing off pages each morning, before filming got under way, and you’d be hard pushed to claim this doesn’t affect the finished product. 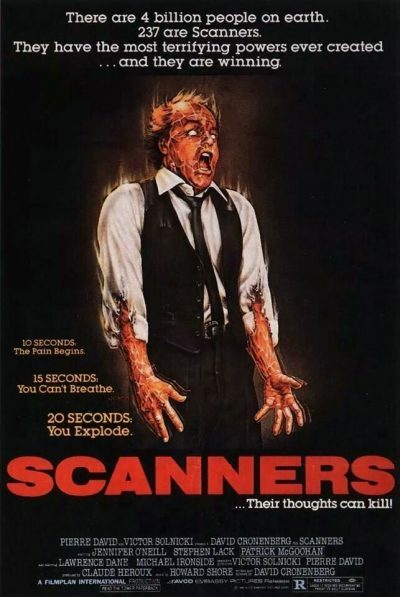 Despite including a scene which is iconic in exploitation history, I can’t honestly say this ranks much off the bottom of Cronenberg’s remarkable genre filmography.